Since the short participation of Russia in the Eurovision Song Contest, the worst rank was the 17th, but there were always good positions received, many second places and thanks to Dima Bilan number one with “Believe” in Belgrade last year. The debut was made in 1994 with “Vechni Stranik” performed be the extravagant singer Youddiph. Nobody ever could have imagined that from the first participation Russia could belong the leading countries in terms of music style and performance. Very popular singers have already been singing for Russia in the ESC like: Alsou, Alla Pugaschova, t.A.T.u. Mumiy Troll and Serebro. This year Russia has the privilege to host the 54th Eurovision Song Contest. The victory of Dima Bilan appeared a bit planned, because the producers put almost everything into this song, which was possible, with the famous violinist and ice skater, a new level of stage presentation has been reached. This is really hard to follow up for others. But the Russian are very proud that after 13 years, the contest has finally come to Moscow. The government has been involved in the planning of the contest and so a brilliant presentation of Moscow, Russia and the Russian music is for sure. In the Russian pre decision Anastasiya could get the highest votes with “Mamo”. 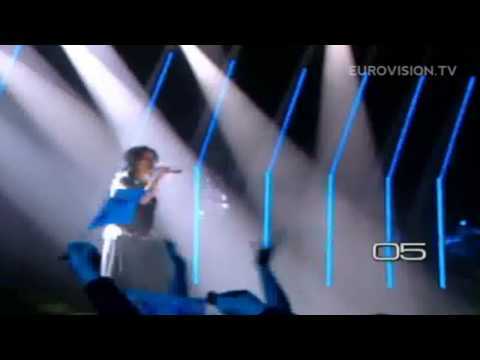 The scandal was that she already wanted to participate in the Ukraine with this song and failed. She receive a kind of wildcard from the Russian Television and could displace the competitors. Who knows if everything went the right way? Compared to the other songs in Russia’s Eurovision history, this is far the worst song! It’s a shame that Russia will present such a song as a host country, nobody can be proud of that. “Mamo” is a dreary and pants song, which is going to make you feel that your TV is struggling to find the right channel. Anastasiya is screaming, roaring and griping and with a little bad luck, she will not receive a single point. She even looks like a shrew, not what we would have expected by the Russian representative. Even if the general standard of this years entry is not that high than last year in Belgrade, this song belongs to the worst in Eurovision history. Sorry Russia, you can do better!